There is a big difference between casually saying you want to achieve a goal and actually sitting down to develop a goal and action plan for accomplishing it. If you want to make the most of goal setting, make sure the one you’ve chosen is well-defined, realistic and will ultimately motivate you to do better and be better. Oh, and you should write it down, too. Adam Jelic introduces us to the Goal Digger Planner from MiGoals and how it can be used for more effective and successful goal setting. Now, that’s a really important point to make as we talk about this subject of better goal setting--the fact that any old goal won’t do. If you want to achieve something, it has to be a goal that actually inspires momentum and drives you to grow in the process. A study conducted in 2014 by Dr. Gail Matthews of Dominican University took these findings a step further. In a direct comparison between goals that were written down and those that were not, she found a significant difference between how much was accomplished. Writing down a goal and developing an action plan for it. Writing down a goal, developing an action plan and sending both to a supportive friend or colleague. Writing down a goal, developing an action plan, sending both to a supportive friend or colleague and providing a weekly progress report, too. As you can see, each of these groups adds one more layer of accountability to the mix. Based on the findings, it’s not surprising at all that the two latter groups (4 and 5) that included sharing goals with a friend proved to be the most effective in terms of getting stuff done. Now, let’s tie this research into what Adam Jelic is talking about today. As Adam explains in the video above, it’s important to follow a certain structure if you want to work towards achieving your goals. Thanks to his MiGoals Goal Digger Planner, he’s enabling goal setters to do just that and in the most effective way possible. Naming your goal should be easy, but Adam suggests putting a bit more thought into even your most basic goals. When naming your goal, be specific, be positive and let it get you excited about the journey you’re about to embark on. Which areas of your life are in need of improvement? Do you want to improve your business relationships? Is your health in need of a reboot? What about personal travel goals? Choose a type of goal you want to work towards and sketch out some details, so it’s easier to take action on it. The question of “What?” goes hand-in-hand with choosing the type of goal. The more detail you can get into about what it is you want to accomplish and how you plan on getting there, the better chance you have in succeeding. The question of “Why?”, on the other hand, should get you thinking more deeply about what purpose it will serve and what’s motivating you in the first place. If your goal were to get 20 new clients by the end of the year, ask yourself why that is. Does the actual quantity matter? Will a focus on quantity over quality drive better results and enable you to hit revenue goals that you’re actually looking to achieve? Try to understand what it is that’s really driving this. You should never stop growing, but that doesn’t mean that goals can go on without an end date. Choose a reasonable timeline for your goal, so you have that sense of urgency to keep you moving along. What’s the fun in working hard if you’re not going to reward yourself? Before you ever step foot on this journey, define what the carrot on the stick will be. As Adam explained, many people won’t fully accomplish their goals. And, you know what? That’s okay. What matters is that you gained something along the journey. So, when you get to that deadline and you’ve put all that work behind you, take time to reflect. Write down the outcomes and celebrate your achievements. Even if you didn’t hit the goal this time, you made progress. What matters most is that you grow from these experiences. You’re setting goals for yourself because you want to feel happier and more confident and in control of your growth, both personally and professionally. But sometimes it’s easier to do that when you have someone to support you along the way. 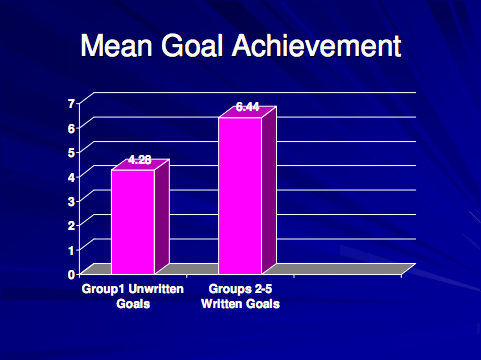 Dr. Matthews was right: accountability plays a huge part in goal setting and achievement. That’s why an accountability partner is something WP Elevation has included in the Blueprint Program as well as something Adam has included in his Goal Digger Planner. As you begin your goal-setting work, be sure to keep that in mind. You may be the one to put in all the work, but you don’t have to do it alone.